The two-hour season premiere of Agent Carter was able to return fans to the characters they enjoyed from season 1 while also establishing the new location of Los Angeles in the 1940s and a new case for the S.S.R. The third episode of the season returns Agent Carter's star Peggy Carter (Hayley Atwell) back to familiar territory for the show as she goes against Chief Jack Thompson's (Chad Michael Murray) wishes. Peggy enlists her own team to lead an investigation into Dr. Jason Wilkes (Reggie Austin), who has been labeled a soviet spy, and the Zero Matter explosion at Isodyne. In 'Better Angels', written by Jose Molina and directed by David Platt, Peggy and Jarvis (James D'Arcy) enlist the help of Howard Stark (Dominic Cooper) in order to investigate Los Angeles' Arena Club, who they discover is attempting to rig the election of Calvin Chadwick (Currie Graham) to become senator. Meanwhile, Whitney Frost (Wynn Everett) becomes concerned with Peggy's involvement in the investigation and Jack gets in deeper with Vernon Masters (Kurtwood Smith), who introduces Jack to the other men of the Arena Club. Despite the serious tone to the beginning of this episode following the supposed death of Wilkes - we later find out he was rendered invisible and non-corporeal by the Zero Matter - Howard Stark's return helps to lighten 'Better Angels'. In fact, with Howard back, Cooper is able to take the more zany moments off the shoulders of Atwell and D'Arcy as Peggy and Jarvis, which were some of the humorous moments that went a little too over-the-top in the premiere episodes. However, that's not to say all the jokes in 'Better Angels' were able to land. While moments between Peggy and Howard were able to remind viewers why they enjoy the characters' dynamic - such as Peggy getting Howard to follow her by luring him with a Bloody Mary - some other jokes may have felt ill-advised. Howard's crude humor can veer on the side of too much to be funny ("Water giggles" is as cringe-inducing as season 1's "Bad babies"). But, the moment where Agent Carter's humor truly shines is in its jab at Marvel Studios, and film studios in general, for the lack of female leads in films. When Peggy and Jarvis first visit the set of Howard's movie, Peggy makes a comment about wanting to be the cowboy in the film rather than a drunken barmaid, to which Howard replies that the audience isn't ready to see a female lead character. Peggy says, "But they're ready for a movie based on a comic book? That sounds like a dreadful idea." (The comic book Peggy references is Marvel Comics' Kid Colt, one of many Marvel references in the episode.) Though the joke may not land with all audience members, the meta jab at movie studios for banking more on comic book movies than female leads hits close to home for Marvel Studios, which has pushed back the release date of its Captain Marvel twice since it was first announced. Still, the ongoing commentary of Agent Carter on the film industry through its own fictional Hollywood is becoming a recurring joke of season 2 that certainly acts as fantastic meta humor for film and TV fans. 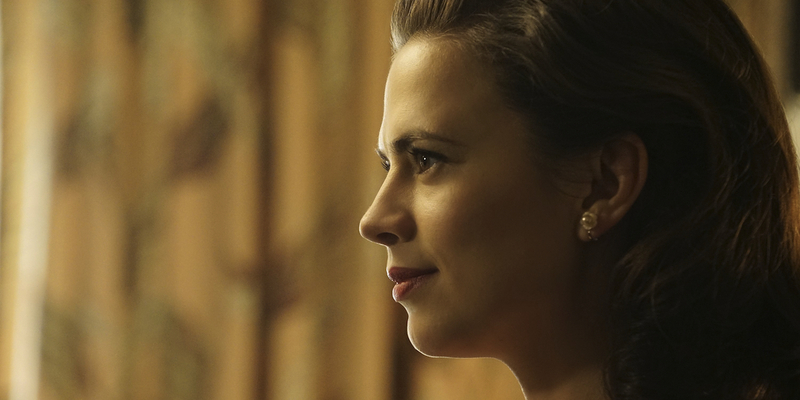 Still, when Peggy, Jarvis, and Howard team together in order to undermine Jack's orders for Peggy to close the case with Wilkes as a soviet spy, despite her confidence that isn't the truth, Agent Carter returns to familiar territory from season 1. Then, Peggy worked with Jarvis to help Howard unbeknownst to the S.S.R. and now she's working against the wishes of Jack to help Wilkes. Though her reasoning is established within the context of the show, Peggy's side of this investigation is too much of a retread of the season 1 premise - she's helping to save/clear the name of a friend who has gotten on the bad side of the S.S.R. - to feel like a fresh storyline, despite its differences. However, the other side of this investigation does feel more original and developed than it did last season. While the S.S.R. hunted Howard Stark in season 1 due to misconceptions, the S.S.R. 's, and more specifically Jack's, motivations in season 2 are much more complex and developed in 'Better Angels'. We learn that he is urged to shut the case of Wilkes by Vernon, who has attempted to manipulate Jack into serving his needs with the belief that the S.S.R. will eventually be phased out. But, in 'Better Angels' Jack hides the Isodyne video documenting the creation of Zero Matter from Vernon at first, then hides his knowledge of what's on the film reel. Additionally, he feigns ignorance of the Arena Club's fixed election when Vernon introduces him to Calvin. Much of Agent Carter is black and white; Peggy, Jarvis, Howard, and Sousa operate as fully moral characters, while Calvin, Whitney, and Vernon are more clearly the antagonists of the season. However, Jack falls somewhere in a morally gray middle state where the viewer isn't sure which side he's really on, or which side he'll choose by the end of the season. Murray carries off the different aspects of Jack well, playing likable and unlikable easily by turn, especially when working alongside Atwell as Peggy and Smith as Vernon. Murray's performance, along with a much more complex character arc, give Jack a more compelling part in Agent Carter season 2. 'Better Angels' also gives us our first real look at Whitney's transformation from Hollywood starlet to genius villain, revealing that her real name is Agnes Cully and the brains behind Isodyne's research. Her conversation with Peggy is reminiscent of the agent's interrogation of Dottie Underwood (Bridget Regan) in the season premiere - which is to say that Peggy and Whitney are written exceptionally well as equally matched adversaries, offering a tease of what's to come once Whitney adopts her villain moniker as Madame Masque. Though the main plot of 'Better Angels' acts as a retread of season 1, the episode features a number of fun interactions between the characters, especially with Howard Stark on the case, more complex character development thanks to Jack and Whitney, as well as enough references to other Marvel properties to please many die-hard fans (one of the best of the episode may be Peggy's love of beating on punching bags that she shares with Steve Rogers a.k.a. Captain America). All in all, 'Better Angels' is a well-directed episode that perfectly showcases what works, and what doesn't, in Agent Carter.